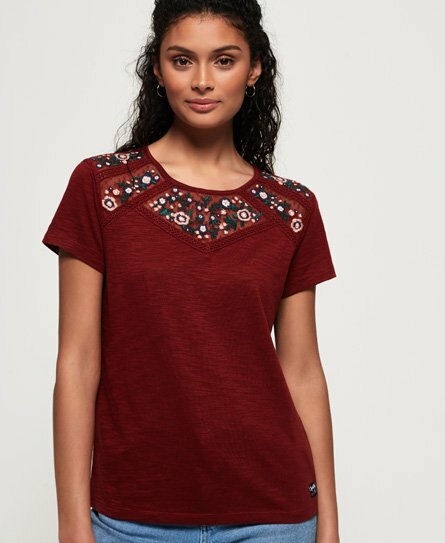 Superdry women’s Whitney embroidered t-shirt. This tee is an easy piece for an impactful look, the sheer mesh and embroidered detailing along the shoulders and back add a delicate and feminine touch to your outfits. This tee also features a flattering crew neckline and short sleeves making it an easy to wear item in your wardrobe. For the finishing flourish, this beautiful tee has a Superdry patch above the hem. Go from day to night pairing this with a skirt, leather jacket and boots for a stylish, on-trend outfit. Or if you want a more everyday vibe, team with jeans and Chelsea boots.